We receive a lot of screenshot from happy readers wanting to show off their big win screenshots, and we can’t have enough of them! Once in a while, however, we get sent wins that stand out from the rest, and this is one such case. The player was spinning the reels on NetEnt’s progressive jackpot slot Divine Fortune on Casilando, when all golden coins fell into place, resulting in a £146,667.81 Mega jackpot win! What’s particularly fascinating about this win is the £1 stake. In most cases, progressive jackpot slots of this kind are designed in such way that higher stakes equal higher chance of triggering the jackpot, which is why it’s uplifting to see a jackpot triggered played on a relatively low stake. 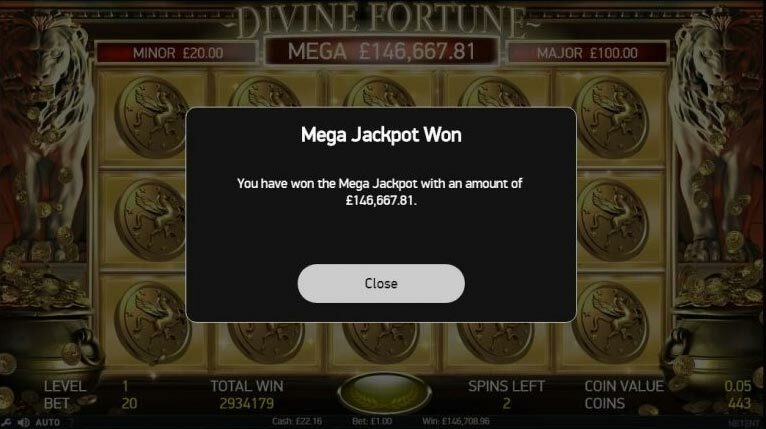 Divine Fortune was released by NetEnt in January 2017 and is a ‘light’ progressive jackpot slot, meaning, the jackpots don’t grow nearly as massive as the more notorious Mega Moolah (Microgaming) and Mega Fortune Dreams (NetEnt). Normally we’re not huge fans of jackpot slots. They usually offer little to no potential aside from the actual jackpots, which, let’s face it, are next to impossible to trigger. Furthermore, they often come with a somewhat lower RTP setting compared to non-jackpot slots. Divine Fortune, however, behaves a bit more like a high variance slot thank’s to the jackpots not being allowed to grow to ridiculous amounts. The 96.6% RTP is more than acceptable as well. Three full rows of gold coins (full screen): Mega Jackpot! If you have any extraordinary wins we’d be happy to share your story here on Bigwinboard.com, so send your screenshots to us. After all, we are the Big Win Authority!